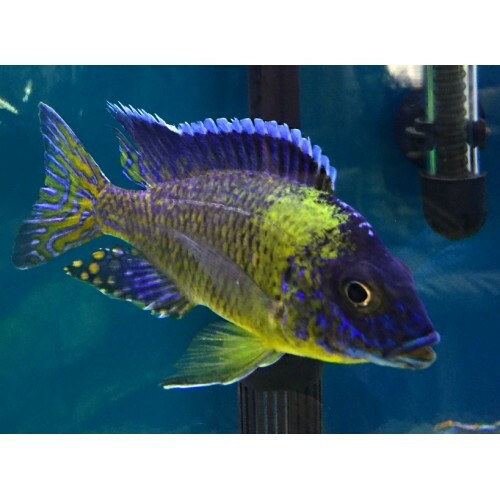 Ordered from Cichlids Are Special twice now and both times have been very satisfied. Reasonable prices, quick shipping, healthy fish. Will definitely order again and would definitely recommend. 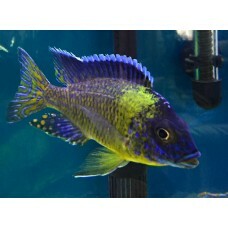 Aulonocara stuartgranti Blue Neon (Chiwindi) males have a blue face with yellow on their body. Faint brown stripes may appear on the body or fade away as well. Their dorsal fin has a bright white upper edge. Blue Neon from this location has yellow on their tail in addition to blue around the edges of the tail. They are a rather attractive and peaceful peacock cichlid. Their yellow is not as bright as Benga/Sunshine but, they provide a nice contrast to Benga in an all-male mixed tank. Blue Neon from this location is not as commonly found in the hobby as those from Undu Point. Photo from James Bouarouy one of my customers. Last, grow out count 02/20/2019. Next, grow out count due 03/15/2019. Grow out counts are counts of the fish in stock checking for additional males and increases in size. This fish is grown out from in-store fry. Base Price is 2.5" Male.